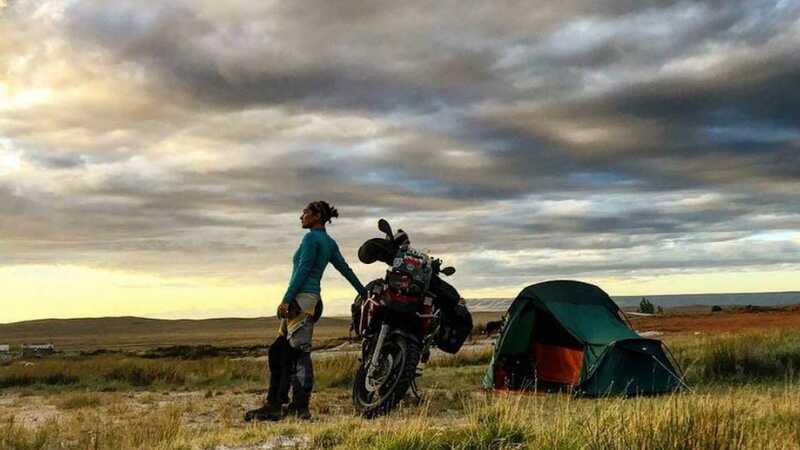 Maral Yazarloo-Pattrick, a record-breaking superbiker, has travelled solo around the world to change attitudes towards women in Iran. Women there are banned from motorbike riding due to modesty laws, but she recently became the first Iranian woman to openly enter the country on a motorbike without being arrested. Dating back around 3,000 years, the qanat is an ingenious and sustainable solution to Iran’s dearth of easily accessible water. If, throughout the ages, there’s one element my people have revered more than fire – known as the ‘Son of God’ in the ancient Iranian faith of Zoroastrianism – it’s undoubtedly water. The Iran in which various Aryan tribes settled millennia ago was a rich, vast and variegated expanse of land, as it is today. It also, however, happened to be incredibly dry. The ancient Iranians had a huge task not only to survive, but also to conquer almost all their then-known world. To find pure water in an arid and unforgiving landscape, and create lush vistas in (literally) the middle of nowhere, might have seemed an impossible undertaking. However, they found an effective and sustainable solution to Iran’s dearth of easily accessible water in the marvel of ancient Iranian engineering known as the kariz, more popularly known by its Arabic name, the qanat. 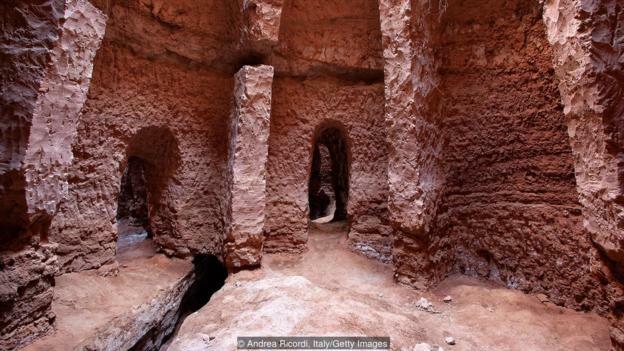 Dating back some 3,000-odd years, and added to Unesco’s World Heritage list in 2016, the qanat is a testament to the ingenuity of the ancient Iranians. Simply put, a qanat is an underground channel that carries fresh water from an elevated source in the mountains to an opening at a lower altitude for the purposes of irrigation – a perfect solution in a region with an abundance of mountains. Once a possible source of fresh water is identified, indicated by the presence of an alluvial fan (a triangle-shaped sedimentary deposit at the base of a mountain), a shaft like one of the ‘anthills’ I’d seen is bored underground until the water source is reached. While in some cases not much digging is required, other shafts can extend up to 300m below ground. Numerous other anthill-like shafts are then bored at regular intervals to extract soil as well as provide ventilation for the workers excavating the earth below. To make things even more difficult, the slope of the qanat must be precisely calculated: too steep an incline, and the water’s downward force will erode the qanat; too flat, and the water won’t flow. The complex system was well worth the effort, however. These underground aqueducts have allowed Iranians for millennia to access and transport water in some of its most arid regions. 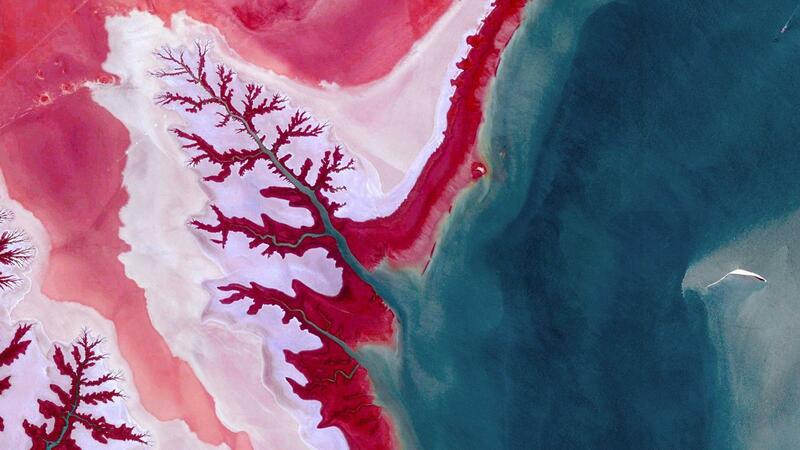 One of the most impressive examples is in the Fars province of south-west Iran. Here, the city of Persepolis was built by the Achaemenid Persians (550-330BC) in a hot and dusty plain surrounded by the Zagros Mountains. The location was not exactly endowed with nature’s bounty. \Yet, by way of the qanat, Persepolis became the epicentre of an empire that stretched from Greece to India, and was regarded by many as the most luxurious city in the world, famed for its opulent palaces and exquisite gardens. As such, it’s easy to see why the distinctly Iranian hue of blue – known as abi in Persian, literally meaning ‘water-like’ – is nothing short of ubiquitous throughout the country. The qanat system was so effective that it soon spread to other corners of the world, first through the ancient Persians’ conquests, and later by way of the Muslim Arabs, who adopted the system from the Persians and carried it with them as far as Andalusia, Sicily and North Africa. According to William B Hemsley in The Qanat: An Ancient Water Supply, so highly did the ancient Egyptians value the qanat system that the Persian emperor Darius the Great “was later honoured with the title of Pharaoh” in return for introducing it to them. Not only does the qanat provide necessary drinking water, it also helps lower indoor temperatures. In Yazd in central Iran, where summers can be stiflingly hot, the qanat is as indispensable as it is ingenious. Used in combination with a badgir (an Iranian wind-catcher), the water in the qanat cools warm incoming air, which enters it through a shaft, before being released into a basement and expelled through the openings at the top of the badgir. In houses in Yazd, for instance, this ancient method of air conditioning is still widely used, and is an inseparable aspect of engineering and architecture. Similarly, the qanat made it possible to store large quantities of ice year round in desert climates. Constructed in conical shapes made of an admixture of heat-resistant materials, and also making use of Iranian wind-catching technology, the yakhchal (literally ‘ice pit’) is an ancient Iranian form of refrigeration dating to around 400BC. In the winter months, water would be sourced from a qanat and left to freeze in the yakhchal’s basement enclosure before being cut into blocks and stored for year-round use. Air entering through the qanat shafts and cooled by the underground water would further assist in reducing temperatures. Heavenly to behold and enjoy – in stark contrast to the parched surroundings – these lush oases, often arranged in four sections as a chahar bagh (literally ‘four gardens’) ­– are replete with trees, flowers, fountains and waterways, all meticulously arranged in harmony and symmetry to reflect the Zoroastrian adoration of nature and the elements. It’s not surprising that descriptions of paradise in the Abrahamic faiths have their origins in the Persian garden, which the Persians called pari-daida (denoting a walled garden), from which the word ‘paradise’ derives. The Bagh-e Shazdeh (Prince’s Garden) near Kerman in central Iran is a dazzling example: seen from above, it beggars belief that such a wonderland of greenery and gushing springs could exist surrounded by nothing but parched earth and rugged mountains. But gardens – which are, by and large, open to the public – can be seen all around the country. When in my native Tehran, I can often be caught sipping on traditional Iranian chai, savouring the picturesque scenery, oblivious to the hustle and bustle on the outside streets, at the Bagh-e Khoshnevisan (Calligraphers’ Garden), Bagh-e Muzeh (Museum Garden) and Bagh-e Ferdows (Paradise Garden), all of which are in the north of the city. I mainly visit to escape the stifling summertime smog, and to enjoy the sound of fountains and singing birds amid leafy plane trees, shrubbery and flowerbeds, all of which evoke the florid poetry of Hafez and Sa’di. 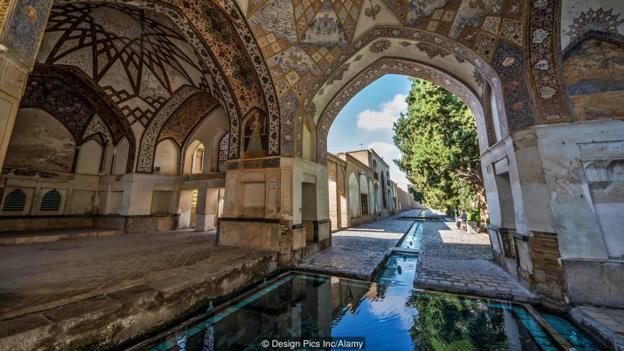 As with the qanat, the Persian garden not only continues to thrive in modern-day Iran – where it also informs much of carpet-making in terms of layout, design and themes – but also elsewhere around the world. The impact of the chahar bagh philosophy can be seen as far away as Versailles in France, the gardens and courtyards of the Alhambra and the palaces of Marrakech, having been imported by the Arabs in the case of the latter two. However, the best examples outside Iran perhaps belong to Mughal-era India and Pakistan. Just as the Mughals considered Persia the apex of refinement when it came to language, so too did they the Persian garden where horticulture and landscape architecture were concerned. Using the chahar bagh as a template, the gardens of the Taj Mahal and Humayun’s Tomb, for example, were naturally called chahar baghs by the Mughals, and still are today. Although technological innovations have reduced the reliance of Iranians on the qanat, the aqueducts are still prominent and widespread throughout the country. With tens of thousands of qanats in Iran today boasting a total distance comparable to that between the Earth and the moon, the ingenuity of the ancient Persians has more than stood the test of time. In accordance with the ancient Iranian/Zoroastrian reverence for nature and the elements, it is incomparable as a sustainable and environmentally friendly method of not only fresh water extraction, but air conditioning and refrigeration. As well, in rural contexts, it allows for the equitable distribution of water, and through the necessity of its ongoing maintenance brings about social collaboration. Despite Cyrus the Great’s world renown as a wise, just and compassionate leader, one can’t help but wonder what the empire he founded – the basis of modern-day Iran, barring politics – would have been without the aid of the qanat. 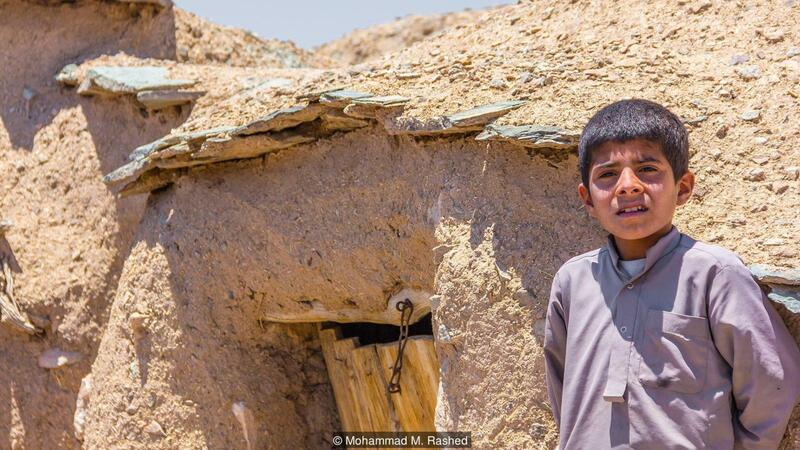 What would the Persian army and people have done without access to fresh water? 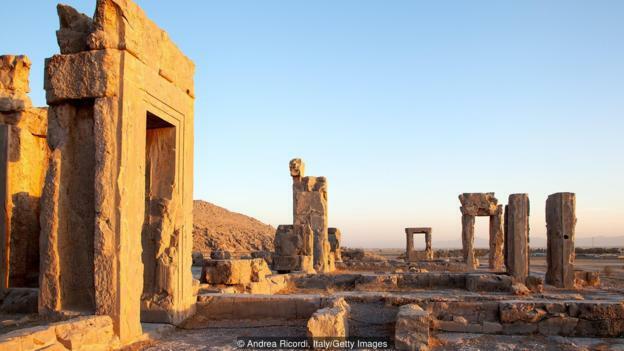 What would Persepolis – and the innumerable cities in the vast dominion of the Empire – have looked like, devoid of the pleasure gardens that forever changed the face of horticulture and landscape architecture? Although indelibly illustrious, the millennia-long tale of Iran is, by and large, a sad one. Ravaged by invaders who threatened to put paid to its rich and ancient cultural heritage, razed to the ground by bloodthirsty warlords, perennially betrayed by its own children, and far too often the victim of foreign ploys, the ‘land of the noble’ has been to hell and back again, and then some. The 19th Century was one of the darkest periods in Iran’s recent history. Ruled by sybaritic autocrats who sold Iran for a pittance to foreigners, and plagued by poverty, disease, ignorance, and an overall state of decrepitude and decay, Iran wasn’t exactly the place to be. Yet, as grim as the picture painted by travellers was, whether by Iranians or European diplomats, that depicted by the artists of the Qajar courts was truly a sight to behold. Sumptuous, iconic, and wholly novel, their artworks nearly have the potential to redeem the Qajars. 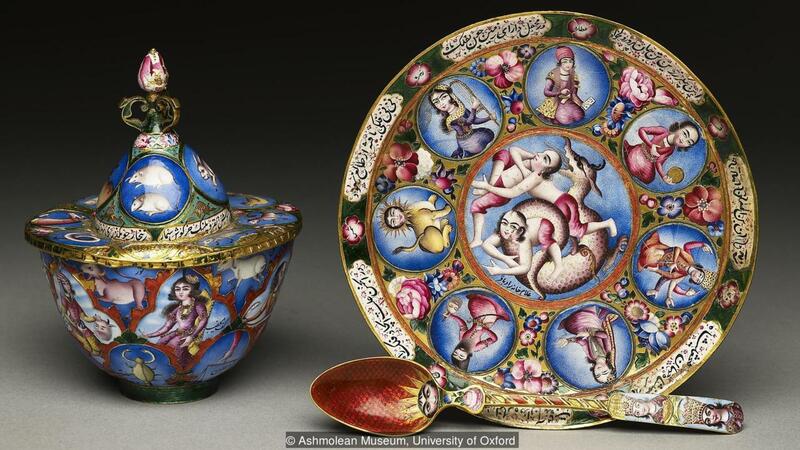 Nearly a century after the fall of Iran’s Qajar dynasty (which lasted from 1785 to 1925), and amidst the festivities of the two-week-long Iranian New Year (Norooz), a landmark exhibition at the Louvre Lens Museum in France, The Rose Empire, is showcasing masterpieces of Qajar art. “In France, we’d never had an exhibition of Qajar art before, so it will be the first one”, says curator Gwenaëlle Fellinger. What’s more, the exhibition’s interior and displays are the work of the fashion designer – and Qajar art lover – Christian Lacroix. During the golden age of the Safavid shahs in the 17th Century, their capital Isfahan was the envy of all who visited it. The site of a major cultural renaissance and crossroads, and an inspiration to artists the world over, it is still referred to by its citizens as ‘half the world’. Things took a downward turn, however, after the death of the greatest ‘Sophy’ (as Shakespeare would have said) of them all, Shah Abbas the Great. By the time the last Safavid monarch, Abbas III, ascended the throne, the sun had set over Iran once again. If the Safavids had ushered in an era of culture and exchange, and the Afsharids and Zands imperialism and peace, that of the Qajars was one of humiliation and depravity. The 18th and 19th Centuries saw Iran stripped of all its former splendour. Vying for power in the strategically important Iran, as well as elsewhere in Central Asia, the Russians and British continually encroached on Iran’s sovereignty. With Iran being ruled by feckless and feeble monarchs, the job was all too easy for foreign conspirators; in fact, in some cases, they didn’t even have to lift a finger. To finance his over-the-top lifestyle, Nassereddin Shah – perhaps the most well-known Qajar monarch – gave a single British baron control over all of Iran’s roads, telegraphs, railways, mills, factories, and most of its natural resources; and another, a monopoly on Iran’s tobacco industry. Foreign intrigue aside, Iran was in a pitiful state. Travellers to the country wrote about the lack of proper infrastructure, hideous living conditions, extreme debauchery (drunken orgies and the like), and corruption. The story at the imperial courts, however, was another matter. Expanding on new forms of aesthetics in painting that were introduced in the Afsharid, Zand, and even late Safavid periods, which broke out of the framework of two-dimensional Persian miniatures, artists at the Qajar courts created a visual vocabulary wholly their own. 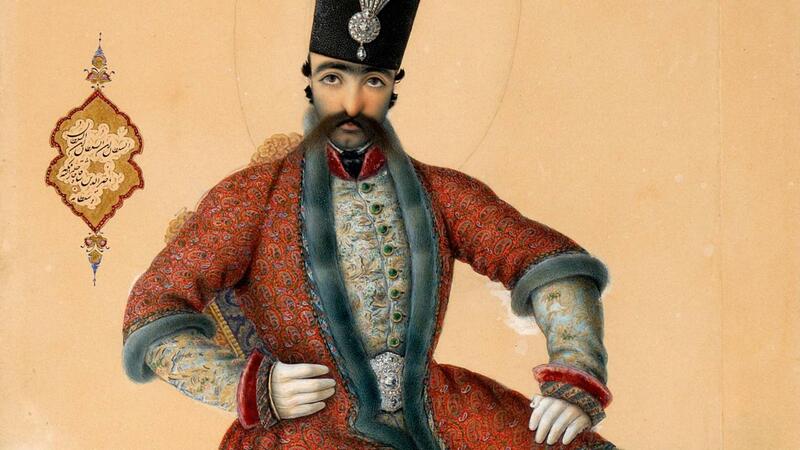 Bedecked in towering crowns topped with aigrettes, glittering brassards, and vivacious robes, and sporting outlandish beards and moustaches, Qajar monarchs like Fat’h Ali Shah, Mohammad Shah, and Nassereddin Shah appeared larger than life, and as works of art in and of themselves. 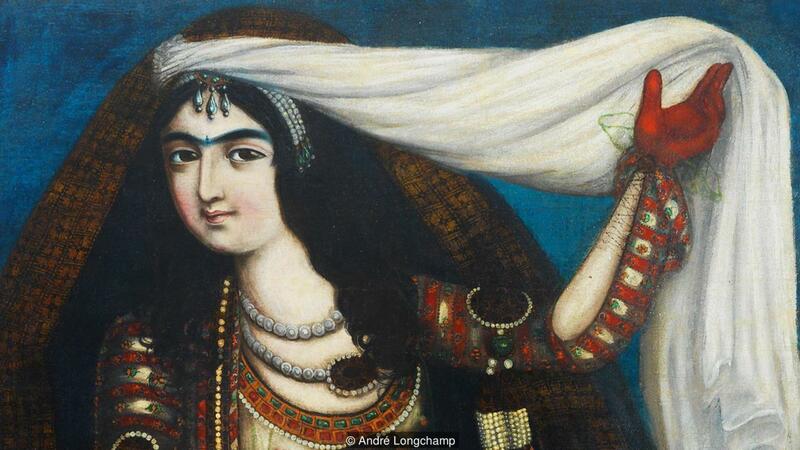 Ditching the dainty and delicate ideals of beauty prevalent in previous eras, painters at the Qajar courts opted for thick, conjoined eyebrows, dark, almond-shaped eyes with coquettish gazes, little rosebud lips, and long, flowing curls. Shahs were attended on by pageboys bearing jewel-encrusted ghalyans (water-pipes), female dancers performed acrobatics on hennaed hands, and belles in diaphanous blouses pouring copious amounts of wine. Elsewhere, Nassereddin Shah, obsessed with all things European and keen to introduce ‘modern’ ways to his country, toyed with photography in his spare time; Antoin Sevruguin captured the lives of the rich, the poor, and the downright wretched on celluloid; and painters like Kamal ol-Molk artfully blended together European and Iranian imagery. In contrast to French and British magazines of the day, which often portrayed the shahs as spineless and degenerate, and Iran as a Persian cat made the plaything of a British lion and Russian bear, courtly paintings and photographs depicted a dazzling wonderland of colour, passion, and every jewel under the sun in which the Shah, ‘God’s Shadow on Earth’, reigned supreme. 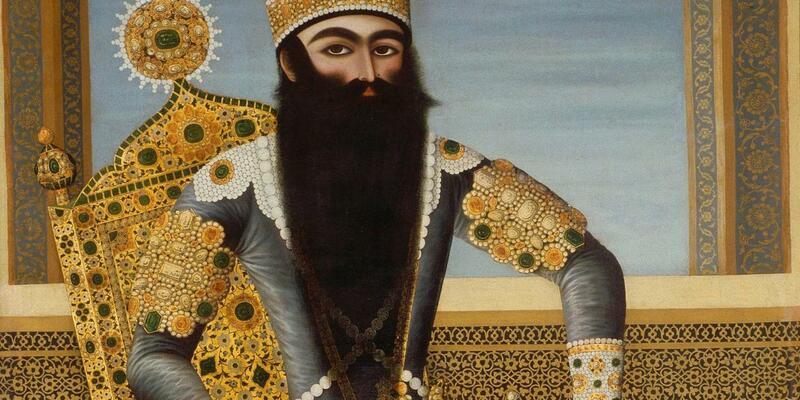 The art of the Qajar era has long been admired by artists and scholars, says Christian Lacroix. “[Its] opulent elegance impressed [fashion photographer] Louise Dahl-Wolfe … She was inspired by Qajar portraits for a famous shooting session – and one of my favourite fashion features ever.” Yet, Qajar art has also been misunderstood and overlooked by many. In this series, Monty travels across the Islamic world and beyond in search of paradise gardens. The Koran, the holy book of Islam, tells of these magical places – green spaces filled with flowers and fruit where shade and water provide a safe haven from the harsh climate that dominates the Arab world. For Muslims, these gardens are an earthly vision of the real paradise awaiting believers in heaven. At the Alhambra, he discovers the basic building blocks of paradise gardens – green spaces divided into four by channels of water that meet at a central fountain. The channels of water that divide the garden are representative of the four rivers of heaven: water, milk, honey and wine. The repeated geometric shapes seen in the fountains and rills are symbolic of heaven and earth and the flowers and fruit provided heady scent that beguiled the weary desert traveller. 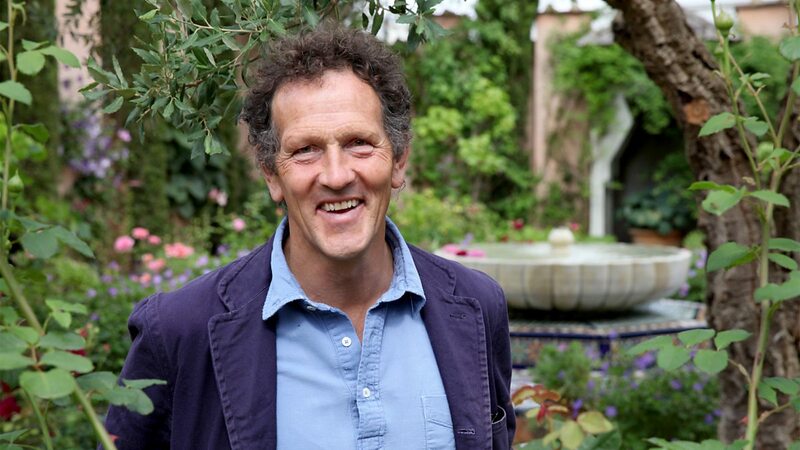 It is Monty’s final stop that sheds the most light on the origins of these incredible gardens. In Iran, he explores the huge influence emanating from the gardens of old Persia. 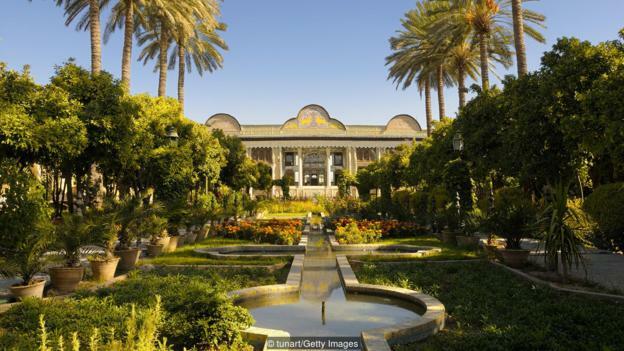 In the cultural centres of Isfahan, Kashan and Shiraz, Monty visits some of the most exquisite gardens in the world and then in the middle of the desert, comes across the secret to their creation. At Pasargadae lie the ruins of the 6th-century palace of Cyrus the Great, and as recent excavations show, at its heart there was a garden. The garden was divided into four, representing the sacred Zoroastrian elements of water, wind, fire and earth. In 1909, two London bookbinders were commissioned to create a book that would become one of the most bedazzling the world had beheld. Joobin Bekhrad reveals how it ended up at the bottom of the Atlantic – and how it still influences today. “When the Titanic went down on the night of April 14 1912 in the sea off the New World, its most eminent victim was a book…” French-Lebanese author Amin Maalouf may have been stretching it a bit in his 1988 historical novel Samarkand. Or not, depending on whom you were to ask at the time. The book in question was a fictional manuscript of the Rubáiyát (Quatrains) by the 11th-Century Iranian polymath Omár Khayyám, prized because it was the only one in existence. In fact, a plethora of copies of the volume of Persian poems existed. There was, however, at the time the Titanic made its ill-fated voyage, one that outshone them all – not in terms of what was written within, but rather, its almost otherworldly appearance. It was this very real manuscript that served as the inspiration for Maalouf’s acclaimed novel. ‘Whoso desireth a peacock must endure the trials of Hindustan’, says a popular Persian proverb. While this particular one refers to the Iranian monarch Nader Shah Afshar’s sacking of Delhi and looting of the famed Peacock Throne (amongst other things) in the mid-18th Century, it might just as well have been coined a few centuries later in London. With a desire to revive medieval traditions of bejewelled bookbinding, George Sutcliffe and Francis Sangorski were renowned throughout the city in the early 1900s for their opulent and over-the-top designs. Accordingly, it was to them that Henry Sotheran’s, a bookstore on Sackville Street, went to commission a book like no other. Cost, according to Sotheran’s, was to be no object; the bookbinders were given carte blanche to let their imagination go wild and conjure the most bedazzling book the world would ever behold. Completed in 1911 after two years of intensive labour, the book – of Edward FitzGerald’s loose Victorian interpretations of Omar Khayyám’s poems, illustrated by Elihu Vedder – came to be known as ‘The Great Omar’, as well as ‘The Book Wonderful’, on account of its sheer splendour. Gracing its gilded cover were three peacocks with bejewelled tails, surrounded by intricate patterns and floral sprays typical of medieval Persian manuscripts, while a Greek bouzouki could be seen on the back. 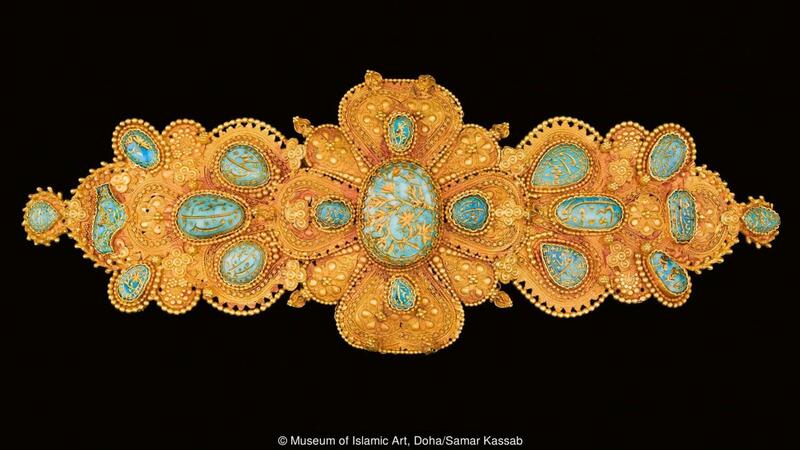 Over 1000 precious and semi-precious stones – rubies, turquoises, emeralds, and others – were used in its making, as well as nearly 5000 pieces of leather, silver, ivory, and ebony inlays, and 600 sheets of 22-karat gold leaf. Although intended to be shipped to New York by Sotheran’s, the booksellers declined to pay the heavy duty imposed on it at US customs. It was returned to England, where it was bought by Gabriel Wells at a Sotheby’s auction for £450 – less than half its reserve price of £1,000. Wells, like Sotheran’s before him, intended to have the masterpiece shipped to America. 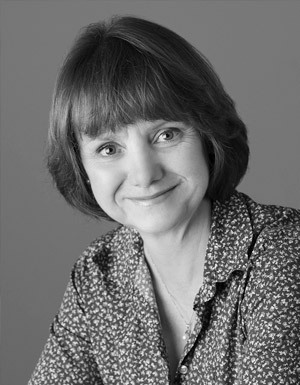 Unluckily for him – and the world – it couldn’t be taken aboard the ship originally chosen. The Titanic was next in line, and the rest needs no explanation. The story, however, didn’t end with the sinking of the Titanic, or even Sangorski’s strange death by drowning some weeks afterwards. Sutcliffe’s nephew Stanley Bray was determined to revive not only the memory of the Great Omar, but also the book itself. Using Sangorski’s original drawings, he managed – after a gruelling six years – to replicate the book, which was placed in a bank vault. The Great Omar, it seemed, had been born under a bad sign, for, during the London Blitz of World War Two, it was – not unlike the poet’s wine jugs, symbolic of human frailty – dashed to pieces. Shaken, but not shattered, Bray once again rolled up his sleeves to produce yet another version of his uncle’s swan song. This time, however, its making wasn’t a matter of years, but decades. Completed after 40 years of on-and-off work, Bray’s tribulations were realised in another stunning reproduction, which he loaned to the British Library, and which his estate bequeathed to the institution following his death, where it can be seen today. “I am not in the least bit superstitious,” Bray remarked shortly before his demise, “even though they do say that the peacock is a symbol of disaster”. 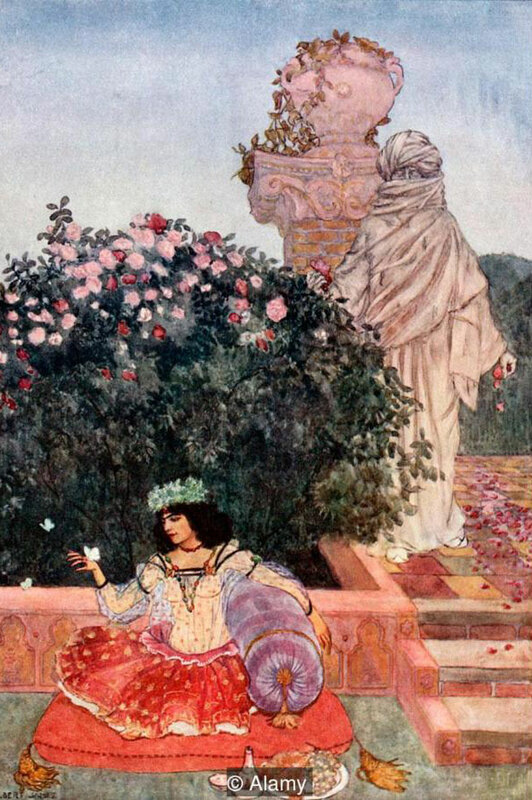 What was the Rubáiyát of Omar Khayyám, and who was this enigmatic personage with whom Sotheran’s, as well as innumerable others, were fascinated? An 11th-Century polymath from eastern Iran, Khayyám was revered in his lifetime for his groundbreaking work in astronomy and mathematics. As with other Iranian polymaths like Ibn Sina (Avicenna), Khayyám was also a poet. That said, his poetry was unlike that of any other Persian poet before him, and he has occupied, for centuries, a place wholly unique in the grand corpus of classical Persian literature. Owing to his inquisitive nature, Khayyám questioned things most around him took for granted: faith, the hereafter, and the meaning of life itself. He had little confidence in the promises of religion, with its talk of Heaven and Hell, and even expressed doubts regarding the logic of God. There was only one thing Khayyám was certain about, and which he cherished: this life. Who, say you, has come from that realm, O heart of mine? Save a name and notion, we can naught else assign. Although he often lamented the ephemerality of life, he also resolved to enjoy himself – with copious amounts of wine (and a few sweethearts, too). 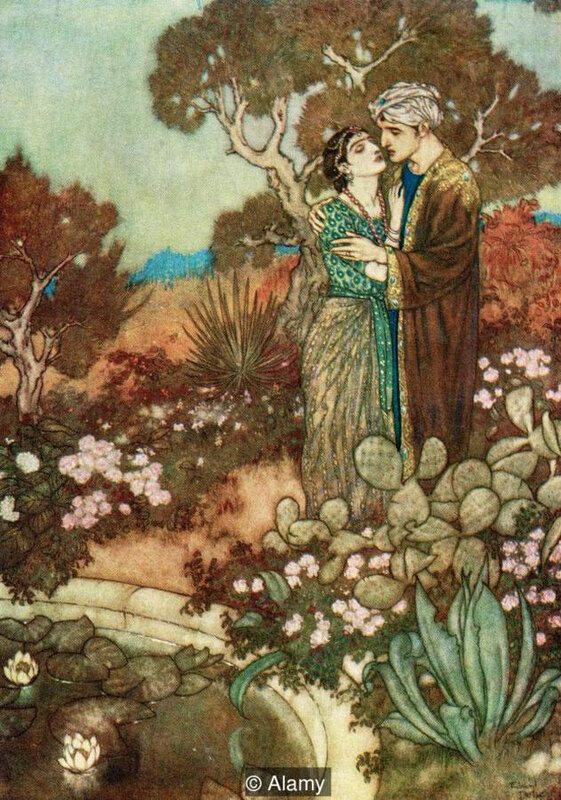 If Goethe had been enamoured of Hafez, and Voltaire Sa’di, the Victorian poet Edward FitzGerald found a kindred Iranian spirit in Khayyám, ‘The Old Tentmaker’. When he turned his attention to Khayyám, he had already translated from the Persian Jami’s Salaman and Absal, as well as an abridged version of Attar’s Conference of the Birds. It was the Rubáiyát, however, that was to prove his magnum opus. Although not exactly a translation of the original Persian poems, FitzGerald’s very loose interpretation captured, to no small degree, the spirit of the Rubáiyát and the poet’s Weltanschauung – hence the reference to the author as ‘FitzOmar’. While it enjoyed little popularity upon its release, the slim yet profound volume soon came to enjoy a popularity FitzGerald could never have imagined. 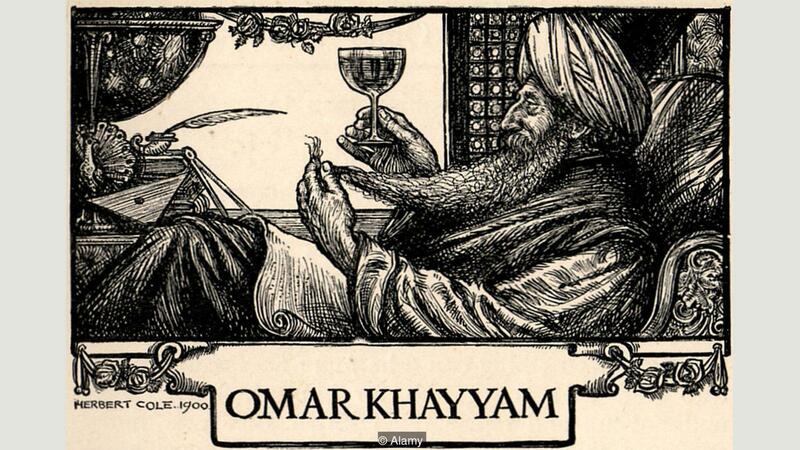 In the late 19th Century, an elite literary salon in London – the still-active Omar Khayyám Club – was named after Khayyám. FitzGerald’s rendition of the Rubáiyát also served as a source of inspiration for Pre-Raphaelite artists such as William Morris, who produced two illuminated manuscripts of it, the second of which also contained illustrations by Edward Burne-Jones. Countless other editions were also produced, with every manner of illustration, by artists such as Edmund Dulac and Edmund Joseph Sullivan. One illustration by the latter, in fact, later came to grace the Grateful Dead’s self-titled 1971 album. Elsewhere, the acclaimed short story writer Hector Hugh Munro chose the nom de plume ‘Saki’ (the title Khayyám used to address his cupbearer), while Agatha Christie’s 1942 novel The Moving Fingerhad a FitzOmar poem as its namesake. That’s not to mention the 1957 Hollywood film made about Khayyám, US actor Alfred Drake’s 1960 recitation of the entire Rubáiyát, and Martin Luther King’s quotation of him in a 1967 anti-war speech (he beat Bill Clinton to it by a few decades), amongst many other instances. In the 1950s, the Rubáiyát was so popular that more than half of it could be found in the compendiums Bartlett’s Quotations and The Oxford Book of Quotations. Khayyám’s poetry has, undeniably, stood the test of time. In his native Iran, he is a towering figure whose book of verse, like that of Hafez’s, is very much a household staple. FitzGerald’s rendition of the Rubáiyát is still, in spite of the prodigious liberties he took, the most well-known English version of it by far, and an English classic in its own right. Elsewhere around the world, his poems can be read in virtually every language imaginable. As such, it’s perhaps no mystery why Sotheran’s chose the Rubáiyát as the raison d’être of Sutcliffe and Sangorski’s bound marvel. But why? How could the words of an 11th-Century polymath have any relevance not only in the Victorian era and the mid-20th Century, but also today? In the first part of Jonathan Swift’s book Gulliver’s Travels, Lemuel Gulliver washes ashore on the island country of Lilliput, where he encounters the Lilliputians, who stand barely taller than 15cm. 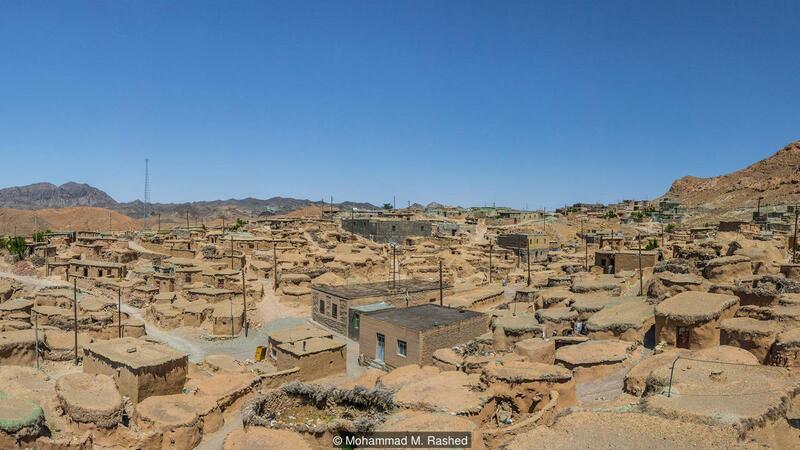 While Swift’s Lilliput is merely a fantasy, a comparable village exists in the eastern extremities of Iran. Up until around a century ago, some of the residents of Makhunik, a 1,500-year-old village roughly 75km west of the Afghan border, measured a mere metre in height – approximately 50cm shorter than the average height at the time. In 2005, a mummified body measuring 25cm in length was found in the region. 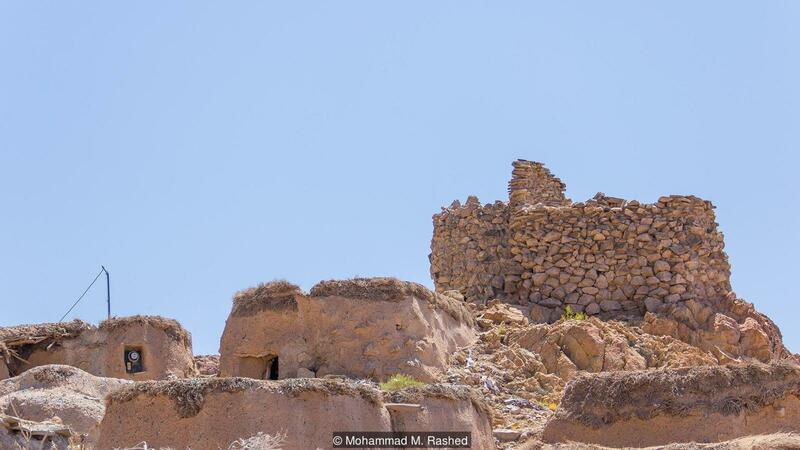 The discovery fuelled the belief that this remote corner of Iran, which consists of 13 villages, including Makhunik, was once home to an ancient ‘City of Dwarfs’. Although experts have determined that the mummy was actually a premature baby who died roughly 400 years ago, they contend that previous generations of Makhunik residents were indeed shorter than usual. Malnutrition significantly contributed to Makhunik residents’ height deficiency. Raising animals was difficult in this dry, desolate region, and turnips, grain, barley and a date-like fruit called jujube constituted the only farming. Makhunik residents subsisted on simple vegetarian dishes such as kashk-beneh (made from whey and a type of pistachio that is grown in the mountains), and pokhteek (a mixture of dried whey and turnip). “When I was a kid no-one drank tea. If someone drank tea, they’d joke and say he was an addict,” recalled Ahmad Rahnama, referring the stereotype that opium addicts drink a lot of tea. The 61-year-old Makhunik resident runs a museum dedicated to Makhunik’s historic architecture and traditional lifestyle. 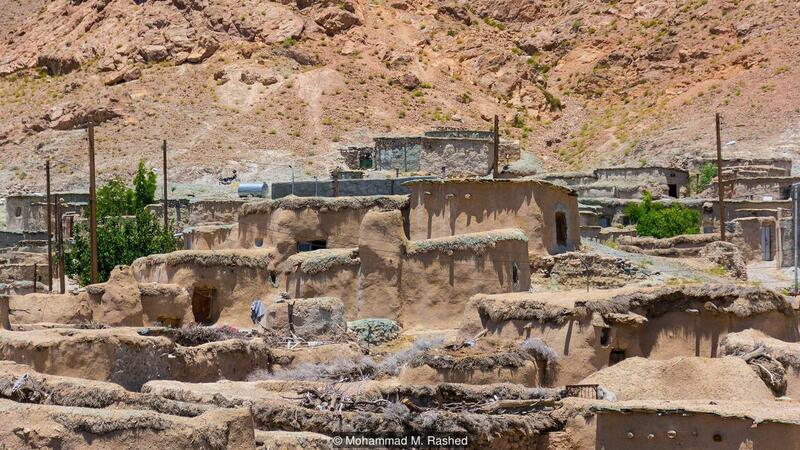 In the mid-20th Century, the construction of roads and the proliferation of vehicles allowed Makhunik residents access to ingredients found in other parts of Iran, such as rice and chicken. “When the vehicles came, people could bring food from nearby towns so there was more to eat than just kashk-beneh and bread,” Rahnam said. Although most of Makhunik’s 700 residents are now of average height, reminders of their ancestors’ shorter statures still persist. Of the roughly 200 stone and clay houses that make up the ancient village, 70 or 80 are exceptionally low, ranging between 1.5 to 2m – with the ceilings of some as low as 1.4m. 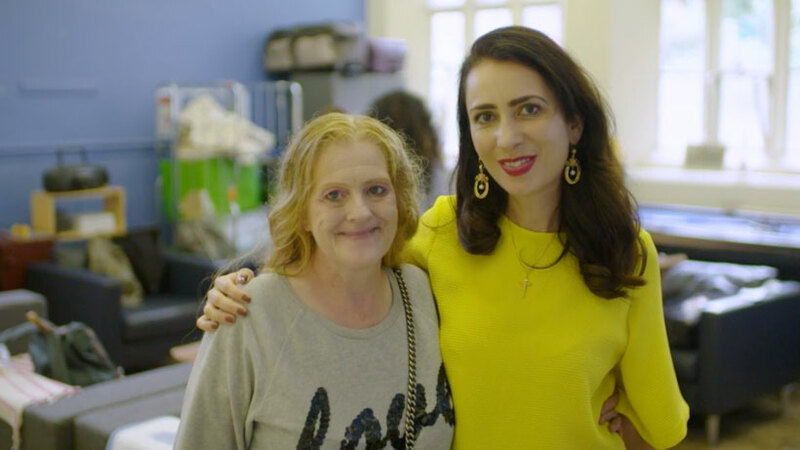 Stooping down, I followed Rahnama into one of Makhunik’s ‘Lilliputian’ homes, ducking through the wooden door that was located on the house’s southern side to let in more light and protect the home’s single room from strong northerly winds. I found myself in a small living quarters known as the ‘sitting room’ – aptly named as I was forced to sit due to the low ceiling. This roughly 10- to 14-sq-m space consisted of the kandik (place for storing grain and wheat), a karshak (a clay stove for cooking) and a sleeping space. Constructing these tiny homes was no easy feat, Rahnama said, and residents’ short stature wasn’t the only reason to build smaller houses. Domestic animals large enough to pull wagons were scarce and proper roads were limited, meaning locals had to carry building supplies by hand for kilometres at a time. Smaller homes required fewer materials, and thus less effort. Additionally, although cramped, smaller houses were easier to heat and cool than larger ones, and blended in more easily with the landscape, making them harder for potential invaders to spot. “Nowadays young people go to nearby cities for work and bring back money and food. The women do some weaving, but aside from that there is no work,” Rahnama said. Meanwhile, older residents have had to rely heavily on government subsidies. Despite the difficult circumstances, Rahnama is hopeful that interest in the village’s unique architecture will lure visitors and that tourism will create more jobs and business. For now, though, “it is what it is,” he told me with a resigned smile.